When my friend Paula told me that I can send a recipe in the original handwriting of my mother, or grandmother, or other beloved person to be transformed into a dish towel that is a replica of that particular recipe card or scrap of paper, I thought that sounded pretty cool. I imagined sending my mother’s chopped liver recipe and ordering dish towels for me and my sisters for Chanukkah. My mother’s chopped liver resides in fond memory for us three Gershun girls (more than washing dishes) and I continue the tradition of “chopping the liver” each year for our holiday celebrations. The dish towels would be a nice gift. I went digging in my recipe drawer to look for the index card sent by my mother almost 25 years ago, when I first moved to Hawaii and wanted to make chopped liver for my local friends. I knew I would recognize her handwriting in an instant, the long slanted lines, often all capital letters, boldly stating the directions or her purpose. I remember quite distinctly the notes I would find on the kitchen counter after school: “Lorrie, I went to the store. The dishwasher is clean.” Translated: “EMPTY THE DISHWASHER.” My mother was a librarian-back in the days when they had card catalogs. Her notes and To Do lists usually came with a title, on the back of a discarded catalog card or index card. At least she listed my chores in basic numerical order and not by Dewy decimals or the Library of Congress. I rifled carefully through the drawer, but couldn’t find the chopped liver recipe. I came across another that she also sent many years ago. 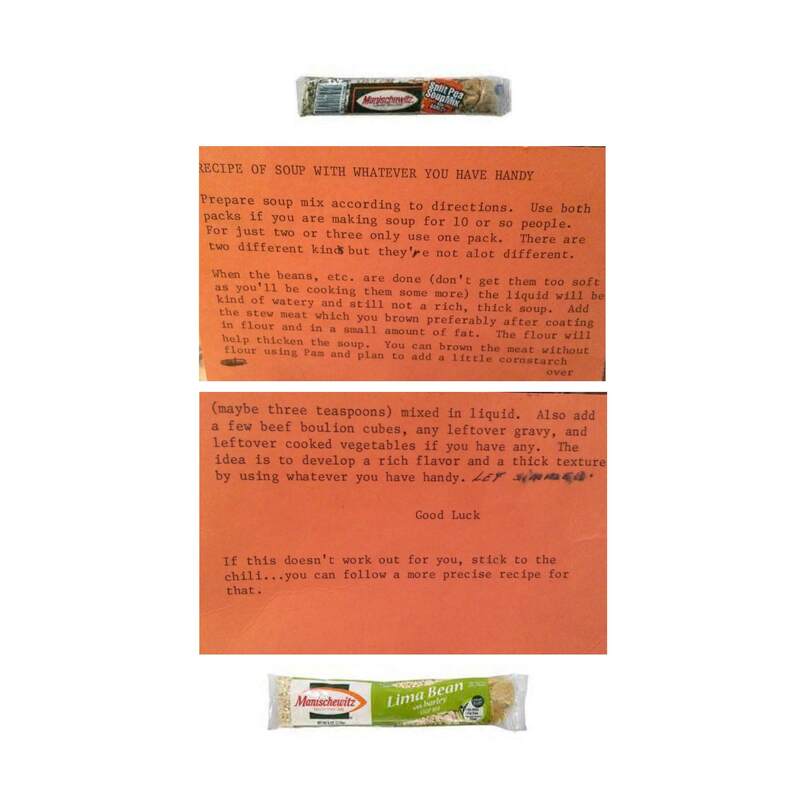 She called it, “RECIPE OF SOUP WITH WHATEVER YOU HAVE HANDY.” It is her directions for using the Manishewitz soup mixes that come in the long packets with barley and beans or peas, another delicious childhood food memory. As soon as I saw it, I was disappointed and thrilled at the same time. The recipe was typed, on an index card of course. It wouldn’t make for a very memorable dish towel, but it served as a reminder that she used to type EVERYTHING –and brought back so many more memories, making it totally worth leaving the dishes on the rack to dry. Not only was she famous in our family for her chopped liver, she was also renowned for her typing prowess. 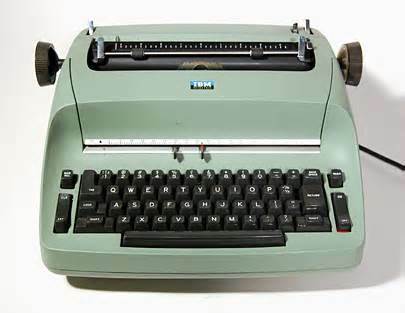 My mother typed fast–over a hundred words a minute…before the electric typewriter. 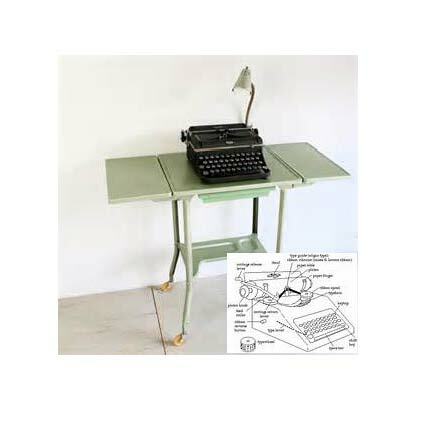 We had one of those black, cast iron, heavy old things settled on an old metal typing table and the rhythm of the tap, tap, tap of her fingers on the keys and the ding of the carriage return were the late night lullabies after bedtime for much of my childhood. My father earned his law degree while I was in elementary school and she typed his papers for him late into the night. When I was in the sixth grade, she went back to graduate school. Once again, she typed late into the night, her fingers dancing on the keyboard, as she pursued the master’s degree that led her to become a librarian and plague me with those notes so carefully crafted on the backs of catalog cards. She deftly used correction fluid and those small slips of powdery white tape to correct her mistakes and carbon paper so that there were duplicates of their work. Typing was big in our family. During the summer before ninth grade, each Gershun girl took a keyboarding class so that we could appropriately turn in typed essays and term papers during our high school careers. My parents’ Midwestern upbringings influenced their commitment to proper form in our casual Southern California surroundings. Handwriting was fitting for thank you notes and To Do lists, formal communication needed to be typed. My mother even typed the excuse notes that I’d take to school after an absence. Don’t tell my kids this, but it made it easier for me to cut class once or twice in high school, before I got caught. I typed the note and scribbled her name in cursive and was good to go–or leave–as the case may be, until the excuse slip actually slipped out of my backpack, onto the floor of the dining room at home, and my mother found it. There was no excuse for this kind of behavior. So much for my clever plan. A lot of kids in my high school senior class received cars or trips to Hawaii for graduation gifts. I got a typewriter–electric. 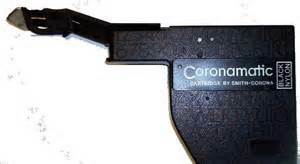 It was a state of the art model that had a correcting tape cartridge that interchanged with the black ribbon cassette for speedy proofreading and editing. Just as college bound kids take laptop computers with them today, I marched off to the dorms with my typewriter in hand, ready to pound out prolific term papers and essays late into the night. It also served as a source of income as I typed others’ papers, charging a dollar a page. Over the years, my mother evolved with the technology. She pursued her PhD with an IBM Selectric with that ball instead of type bars, so that she could whiz about the keyboard even faster. She kind of slowed down when the word processor was introduced and never quite got the hang of her Apple computer, cursing that *! !$% thing as it posed one challenge too many. Not to mention the #$#@$ printer. Luckily, by then, her girls had long since graduated from college, women earning their own degrees, well adapted to whatever keyboard might come their way. She didn’t really need to type very much at this point and had basic email skills. I can’t even imagine what she would say about text messaging. I’m sure my sisters won’t mind that I don’t have dishtowels to send them for Chanukkah, as none of us particularly enjoys doing dishes and neither did our mother. We are just not that type. It’s nice that it led me to this memory to share, a holiday greeting from our mom, both handwritten and in typeface–proofread and edited for perfection–just for us. When my husband suggested that we get married on my birthday I wasn’t sure why he thought it was a good idea. He joked that it was so he wouldn’t forget our anniversary, but even at that time I knew him well enough to know that it was not the case. I told him that as long as he did not forget my birthday, I was willing to go for it. I still don’t know why he chose that date, but I’m not sorry. It was a great idea. I married him on my 45th birthday and it is the best present I ever got. 2011 marked our fourth wedding anniversary, among other things. I was born on December 26. This year, not only did we celebrate what we have come to call our Birthaversary, but we added in the 7th night of Chanukkah, making it a Birthaversariakkah. There are two very special days on the calendar when I get to choose the family activity without absolutely no input from, or consideration of, anybody else: Mother’s Day and my Birthday. Considering my usual Jewish Mother’s consideration of each family member in almost everything I do, I embrace these opportunities with abandon and glee and almost always choose a day at the beach or a hike. Luckily my family likes these activities too. For this Birthaversariakkah I chose a hike. 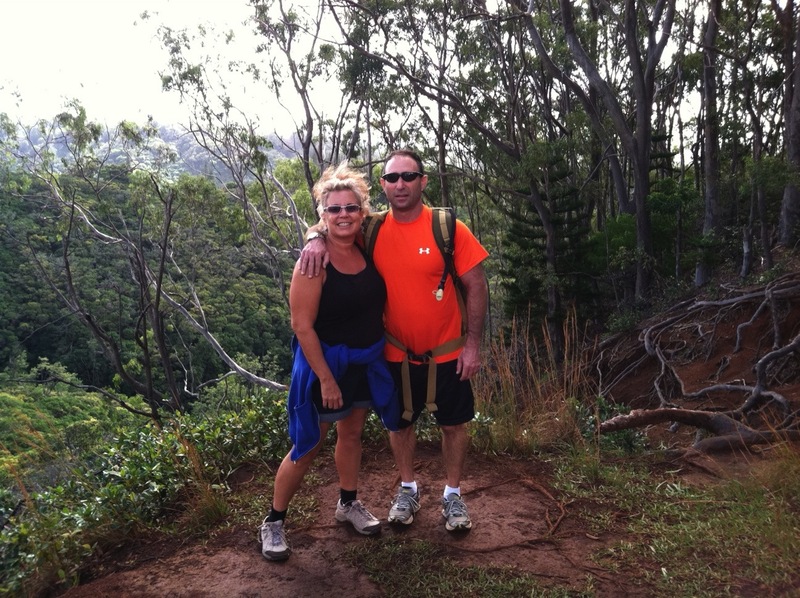 We went to Aiea Loop Trail where my husband proposed 5 years ago. This time we did the entire loop. Now I know why we usually turn around. 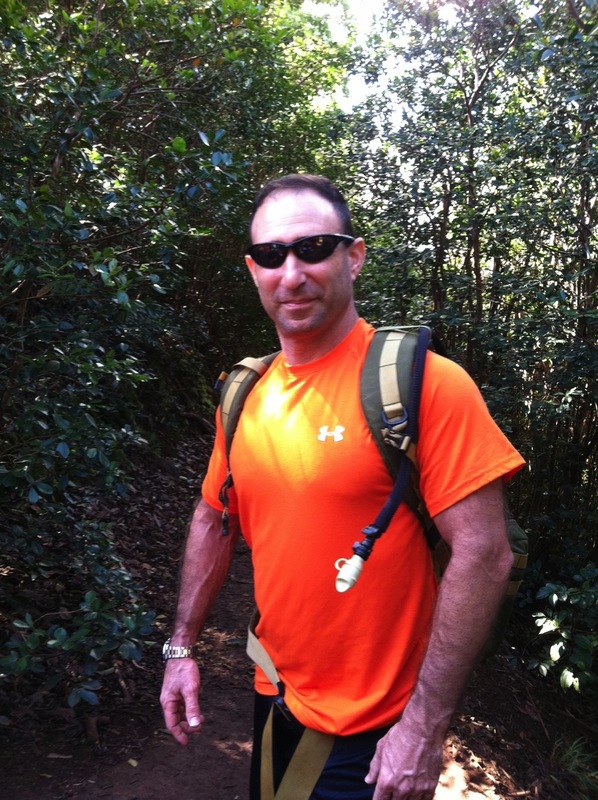 It took almost four hours to plod up and down the ridge, across the gulch and slosh through the 5 miles of muddy trail. 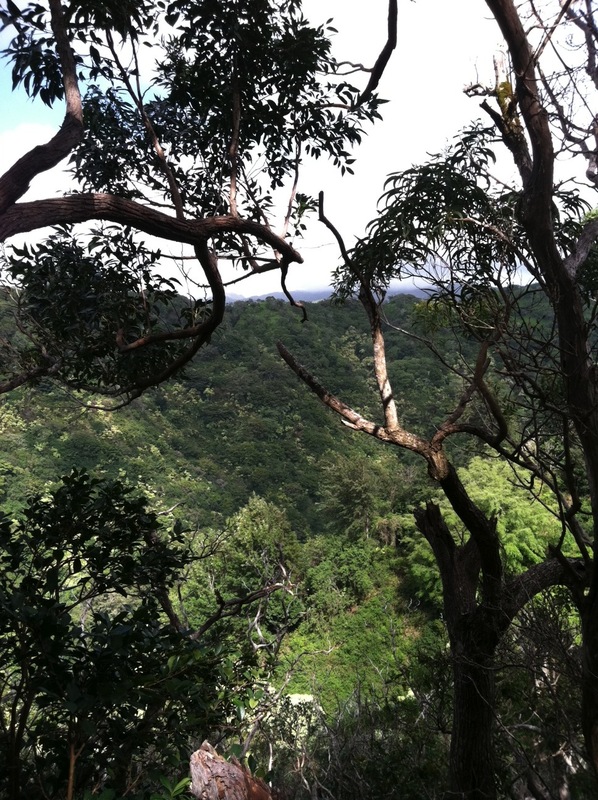 But it offers beautiful views of Pearl Harbor and the Tetsuo Harano tunnel on H3, the usual benefits of the great outdoors and nice memories of the day he stopped us at the side of the path and, with a rainbow in the background, asked me to marry him. We took a picture at the spot. Once again, it was the perfect hike and the perfect day. The kids behaved particularly well, often running ahead and leaving us to enjoy each others’ company, appreciate some peace and quiet and sneak in an affectionate smooch here and there. We took some great photos. And between husband and teenager, I made it through the extra slippery parts without falling. We ended the day eating saimin at Forty Niner’s, another family favorite, and lit the candles at home that night. Thank you for a very Happy Birthaversariakkah handsome Husband and loving family. It was a wonderful celebration. Everybody gets to celebrate today. Hallelujah! 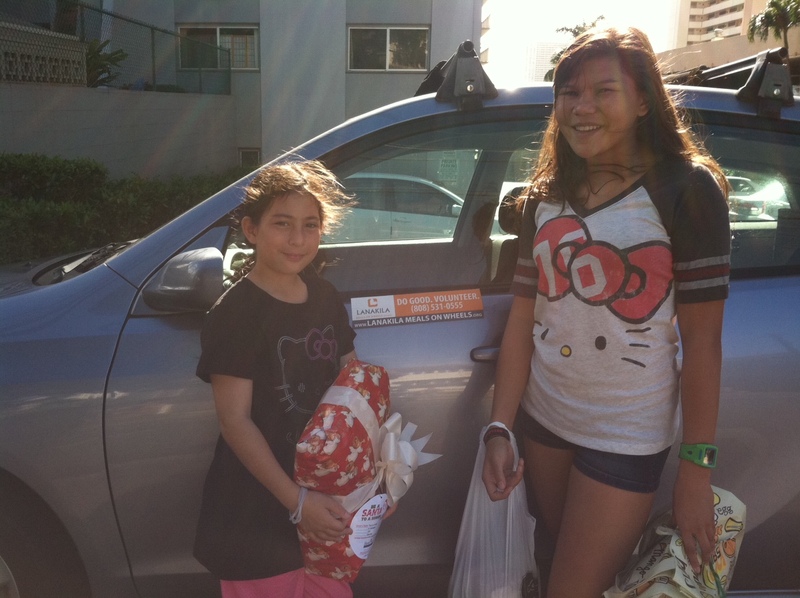 My family is spending this Christmas morning delivering holiday meals for Lanakila Pacific’s Meals on Wheels program. 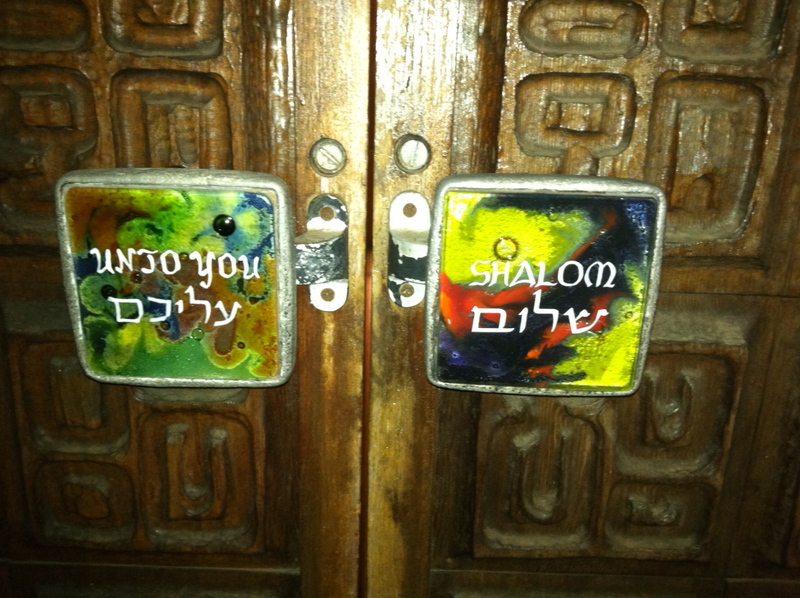 Our Synagogue organizes an annual group of volunteers and we joined the team three years ago. We have made it a family tradition ever since. And tonight we will celebrate the sixth night of Chanukkah with a holiday meal shared among friends at our home. 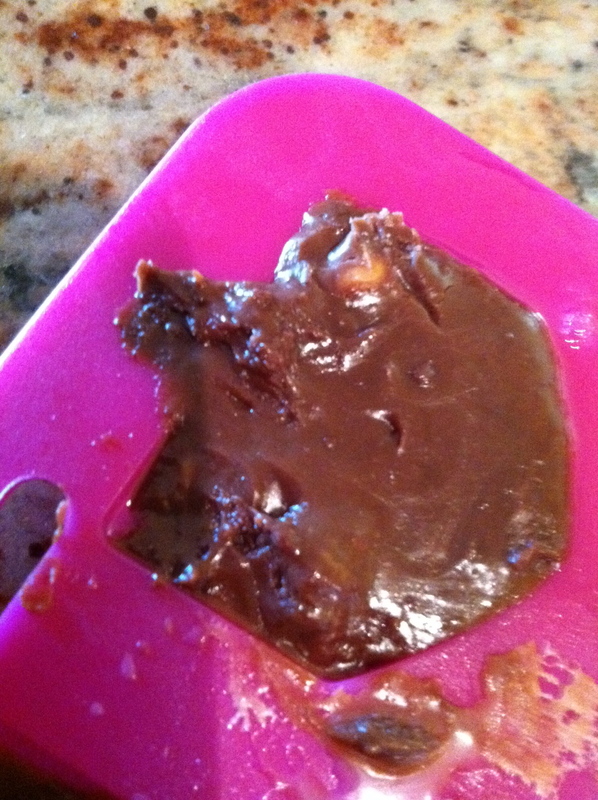 I got up early to make chocolate fudge dreidles with the mold we got as a gift from my younger sister, boo. 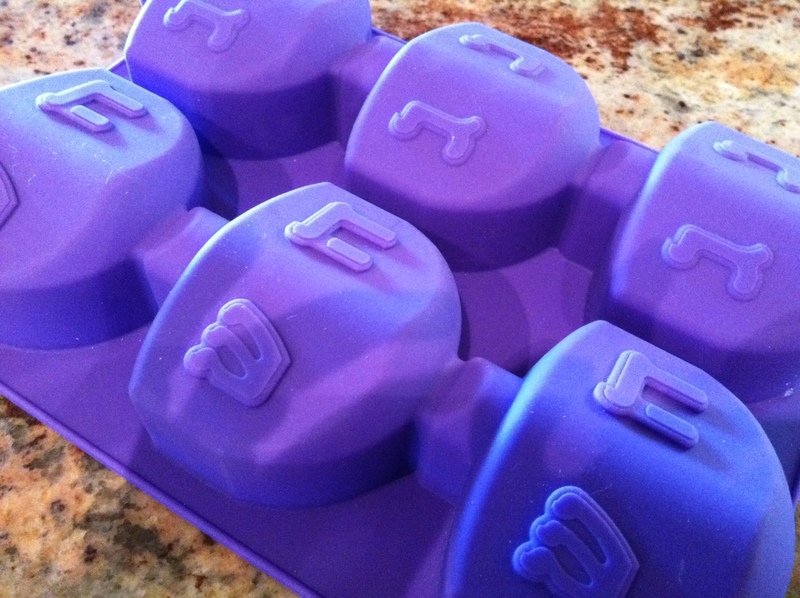 We’ll make brownies later with the other molds she sent. Of course we will make latkes too. Whenever I cook for the Jewish holidays it makes me think of my mom, especially when I make chopped liver. It was her specialty. She used a hand grinder to combine the liver and eggs and onions. When food processors debuted she continued to grind it by hand, insisting that the new contraption made the liver to mushy. She put it in a circle mold and served it with mini pieces of rye bread. My dad loved it. I started making it about ten years ago for celebrations at our home in Hawaii. 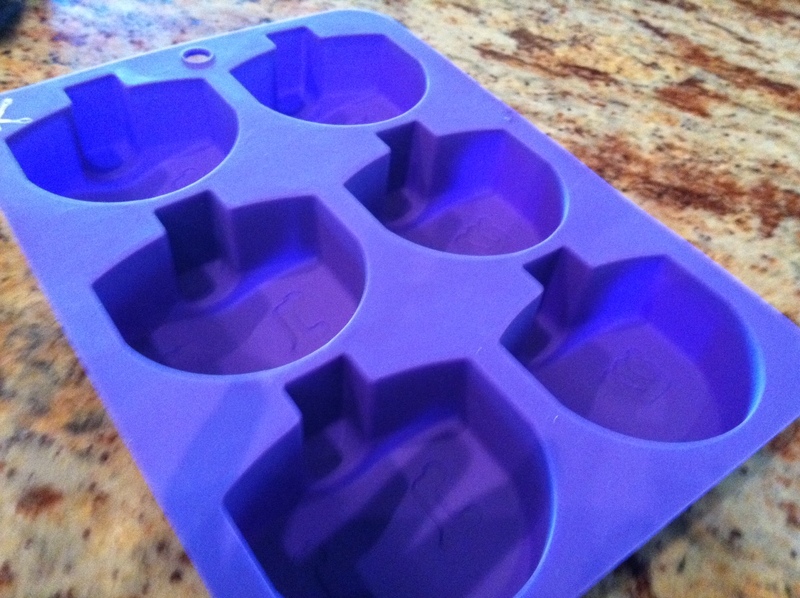 It connected us to her, living so far away, as she shared her recipe and techniques. It evoked vivid memories of childhood that I could share with my daughter. And now it brings wonderful memories of my mom (may she rest in peace) and makes me miss her very much. 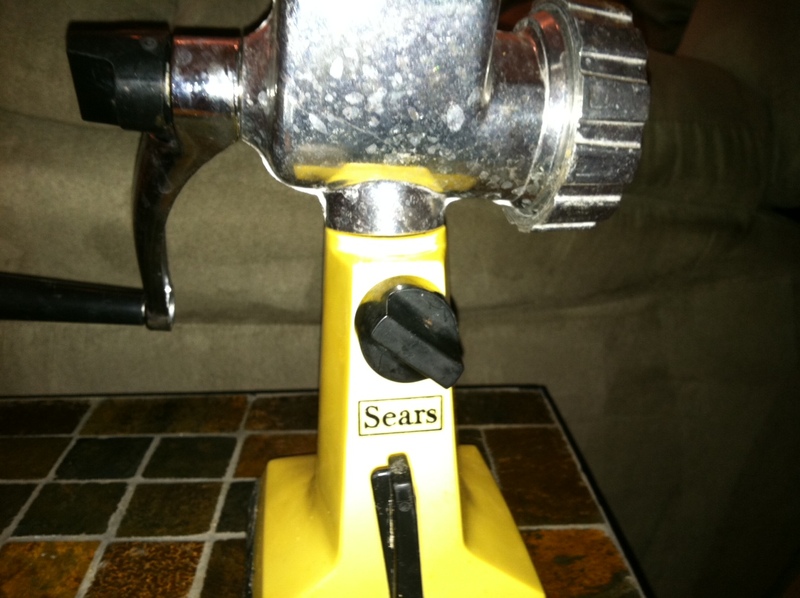 The first time I made it, she sent me a meat grinder she used post Betty Crocker mixer. I still use it every year. I’m willing to use a food processor for the potatoes for the latkes, but in honor of Gloria, not for the liver. The biggest obstacles have been the shmaltz (chicken fat) and the liver. You can’t buy shmaltz in Hawaii. One year she came to visit around Chanukkah time and brought a small cooler on the plane with a jar of schmaltz just for me. Talk about the love of a Jewish Mother! Since then, I have alternately made my own or just used Crisco. 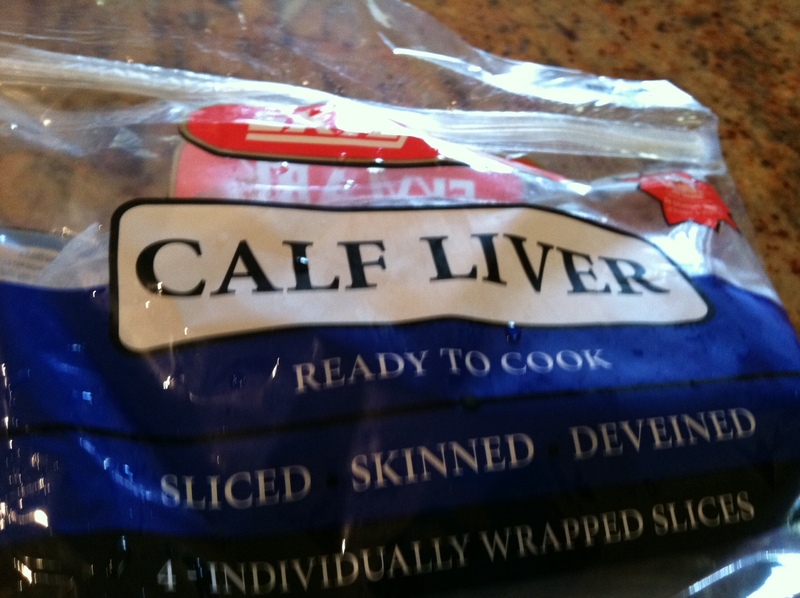 My mom always swore that calf’s liver was the best choice for chopped liver. I have looked island wide for years, never found any and had to let chicken livers suffice. I ordered them fresh from Tamura Super Market in Wai’anae and they turned out just fine. This year I found calf liver in the commissary. Oh Happy Day. On this Christmas day, I will grind the liver and eggs and onions as my mother has done before me. We will fry latkes as Jews around the world have done for ages. We will start a new tradition of making chocolate dreidles for dessert. And on this sixth night of Chanukkah, we will embrace our holiday traditions as we light the candles, say the blessings, share a meal and honor all of the miracles that people celebrate this season. 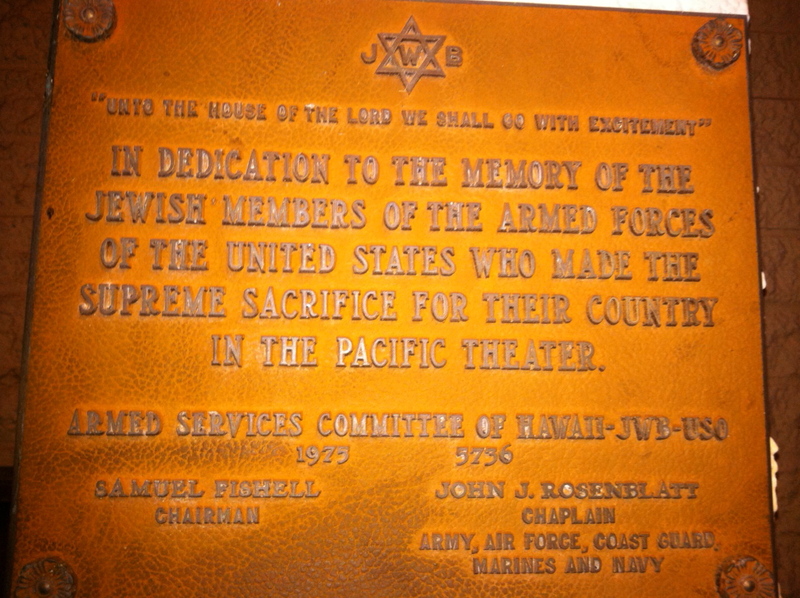 Our family came together with the community at the Aloha Jewish Chapel at Joint Base Pearl Harbor…literally. 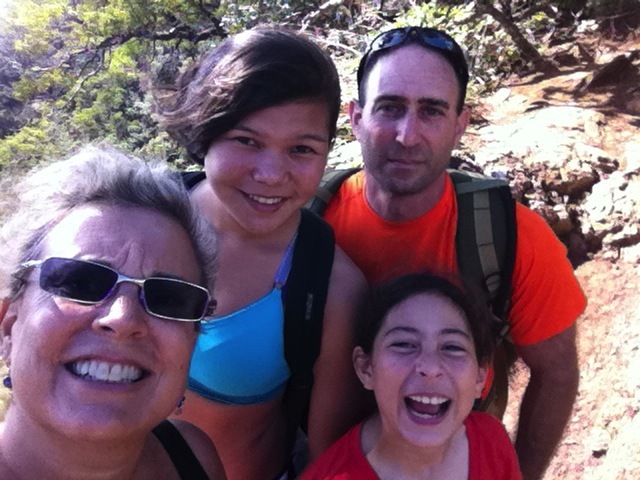 After several relaxing, peaceful, child free days, my husband picked up our younger girl from Camp Erdman in Mokuleia on the North Shore and drove straight to Pearl Harbor. 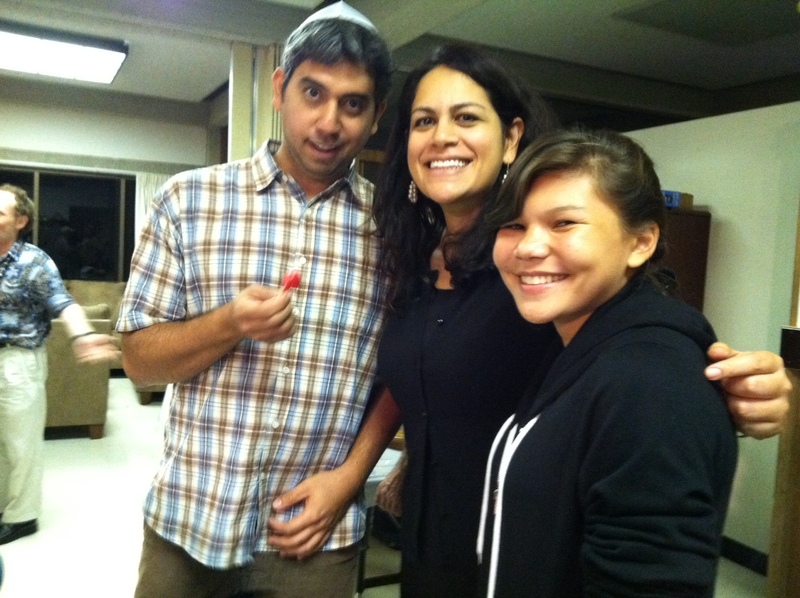 I brought the teenager from hula practice and we reconvened as a family for Friday night services and Chanukkah celebration. 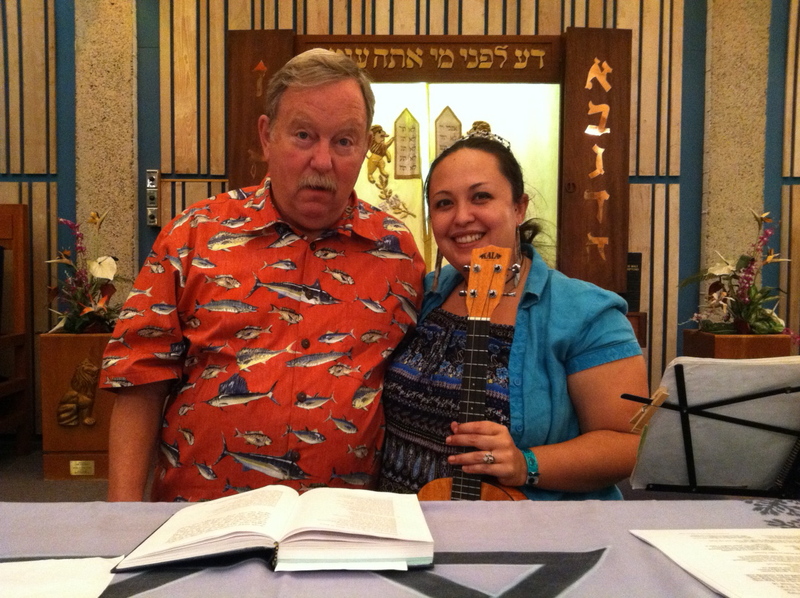 I met my husband the first time I attended the Aloha Jewish Chapel (AJC) almost nine years ago. My very long time friend Dan Bender who leads the services at the Chapel introduced us. Much of our early courtship was spent sitting side by side at Friday night services. We progressed to marriage from there. Before I went to AJC I wasn’t aware that there is a vibrant Jewish community in the military. I didn’t know much about the military in general. It was out of my realm of experience. I’ve learned a lot since then, considering I married a Jewish soldier and am now, among other things, an Army wife. 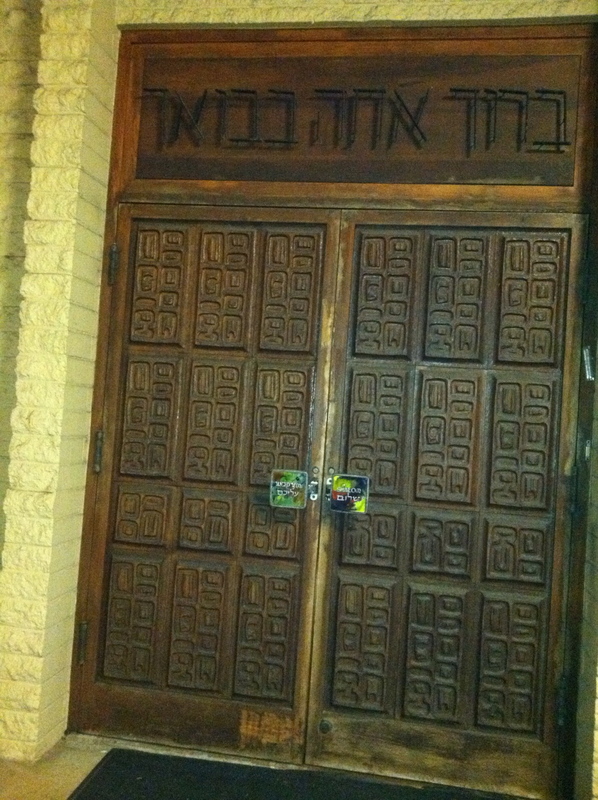 The Aloha Jewish Chapel was built in the 1970’s and is the first free-standing Jewish chapel built by the United States government exclusively for Jewish worship. Besides being a special place in terms of history, we like it because our friend, Dan, leads the services. I’ve known Dan since I was in college in L.A.. We both taught Hebrew at Temple Emanuel in Beverly Hills and found each other again after I moved to Hawaii over 20 years ago. We go way back. Our family enjoys Friday night services at AJC and our local Temple Emanu-El, but more often find ourselves at Pearl Harbor due to the proximity to our house and not having to drive in Friday evening traffic to get there. Last night was a nice community celebration. A mixed crowd of retired military, young active duty couples, various dependents and local guests came together for latkes, dreidle and song. We were happy to see the Donlins there and I took a picture of the Kamehameha grads with my teenager happy that they are a great role model for my Jewaiian girl. My spirit is renewed and refreshed by an evening with family and community in common celebration. Happy Hanukkah. 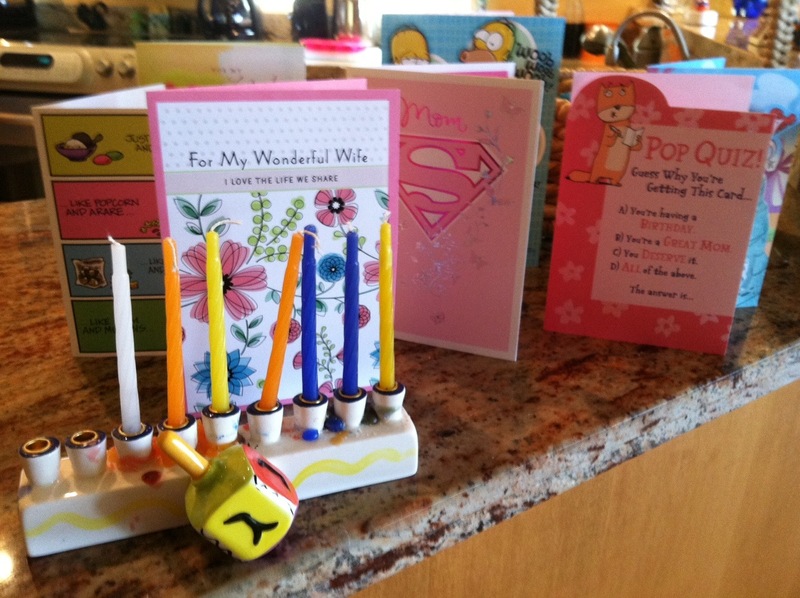 We tell our kids all the time, “Chanukkah is not a major holiday in the Jewish tradition. It’s only a festival.” It is a wonderful celebration of bravery and miracles and light, but it has nothing to do with presents. Americans added on that part because of Christmas. Then we spend 8 nights lighting candles, playing dreidle, eating more than our share of fried food and giving them too many presents. I can’t help it. I love picking out presents for them. This year we ended up sort of practicing what we preach. We were not together as a family for the first few nights. We have celebrated from different shores. We haven’t given them any presents…. yet. Not only is this the holiday season, but it is also our wedding anniversary and my birthday. Yes, we got married on my birthday, December 26. 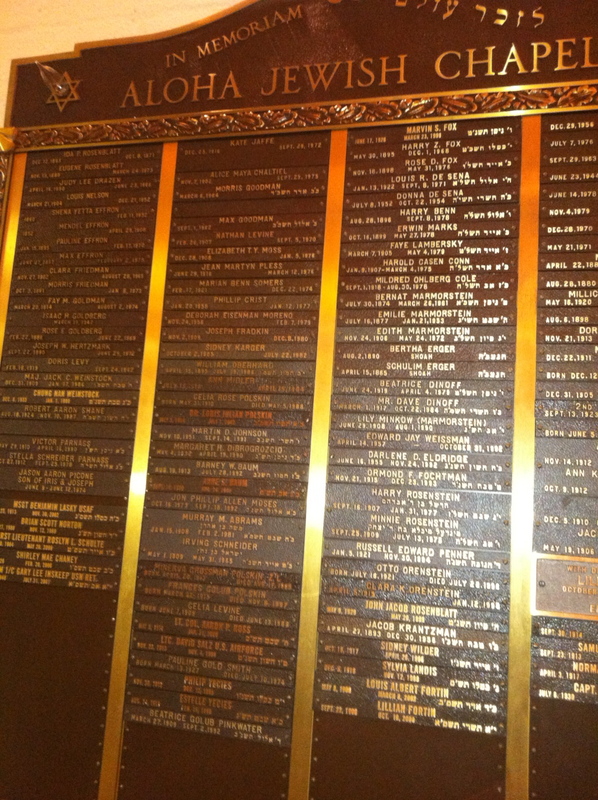 When Chanukkah falls during the later part of December, all of these celebrations converge. My husband and I like to celebrate what we call our “Birthaversary” each year by getting away alone together for a few days. Since we were expecting his mother to arrive next week, we celebrated early, thus missing the first few nights of Chanukkah with our daughters. 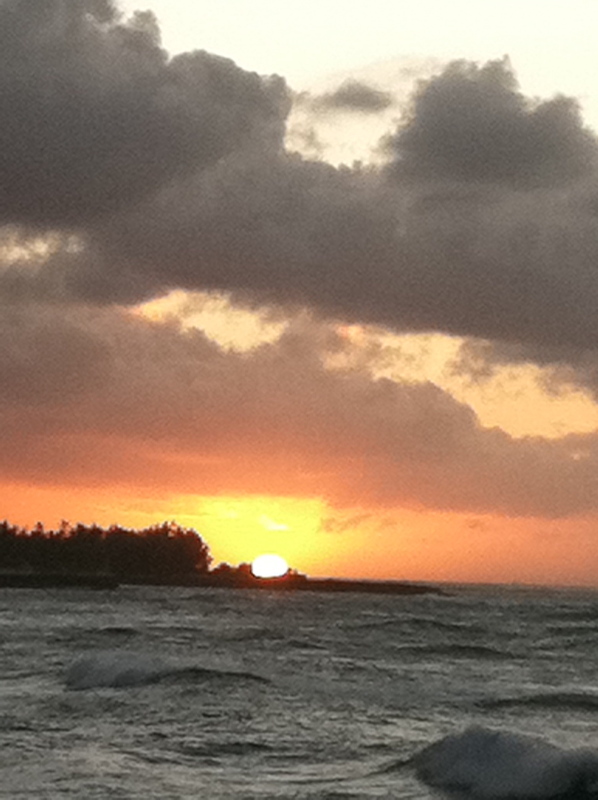 The younger girl has spent 5 glorious days at Camp Erdman in Mokuleia. We packed her and some dreidles and some chocolate coins and dropped her off last Sunday. 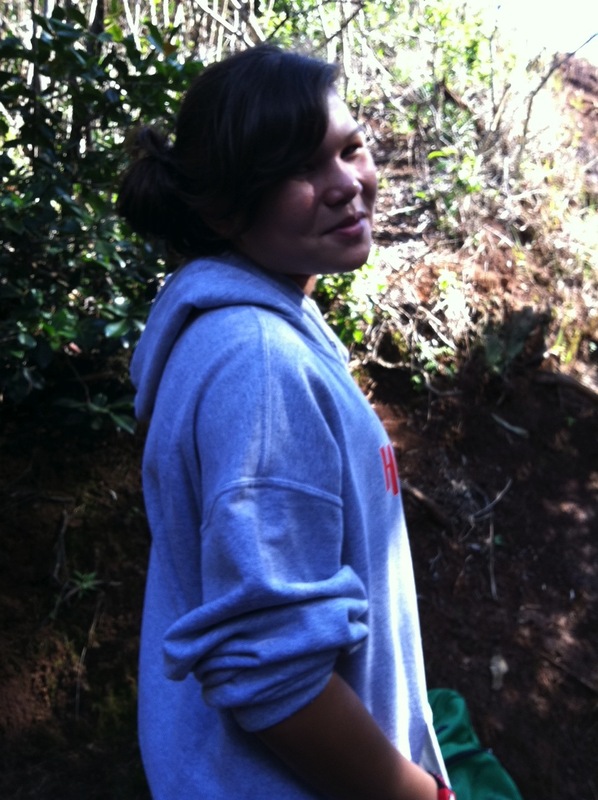 Our teenager stayed with her grandmother on the West Side enjoying family and going back and forth to wrestling practice in Kapalama. Husband and I packed our own bags, plus an extra one filled with snacks and drinks and hit the road for the North Shore of Oahu to our favorite getaway destination, Turtle Bay Resort. 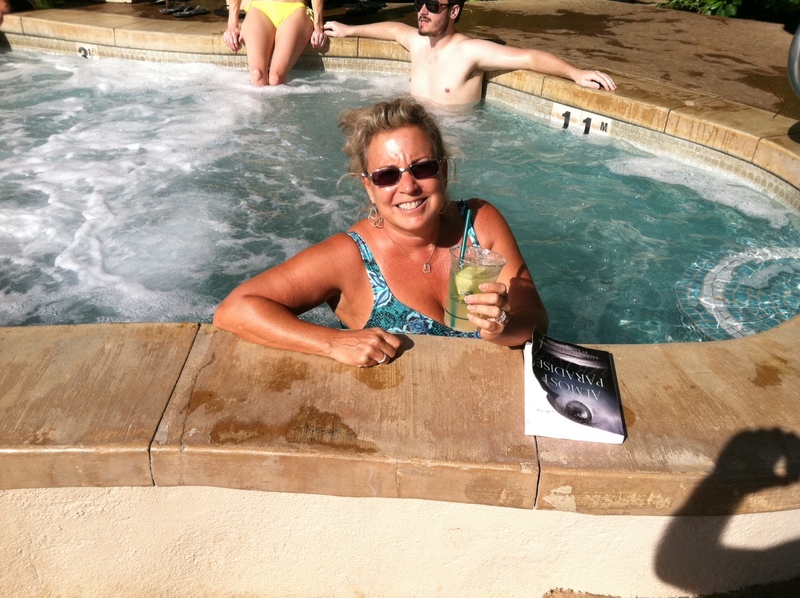 It has become a tradition for us to celebrate together in this beautiful vacation spot. Before we were married, he was deployed in Iraq from 2004-2006. He came to Hawaii to spend a week of his R & R leave with me at this very place. We have come back every year since that romantic week in 2005. It was just as romantic this year. 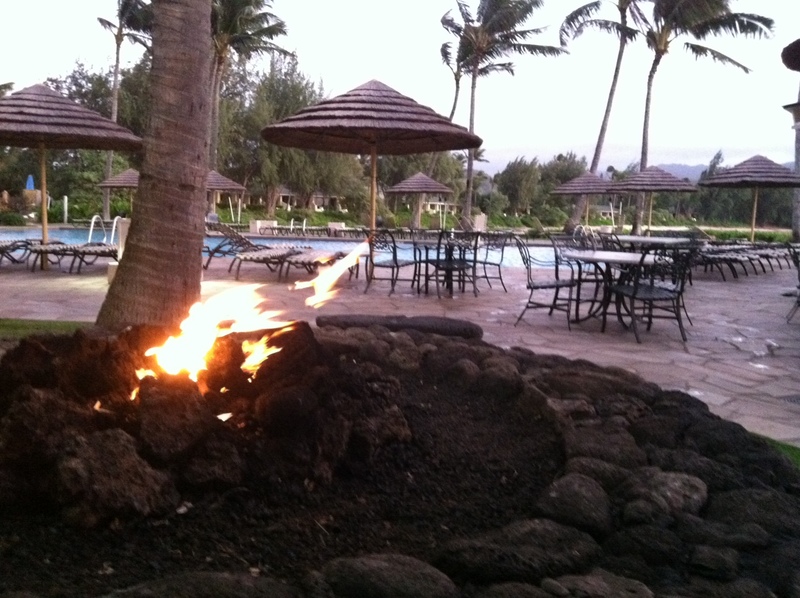 What I love about the Turtle Bay Resort is that it really feels like being away on an outer island without the hassle or expense of getting on a plane or renting a car. We only spent a few days on the North Shore, but it was enough to relax, disconnect from the demands of daily life and reconnect with each other. I consider that a great way to celebrate a holiday and a minor miracle in and of itself. 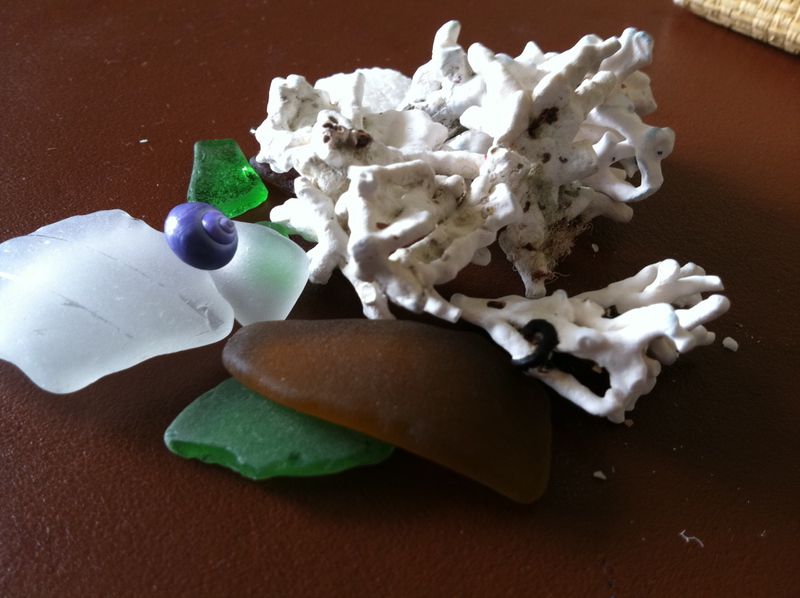 We enjoyed the secluded beaches to the North of the resort, walking for a few miles along the coastline, dipping our feet in the water, picking up sea glass and coral and embracing the sun and salt air. 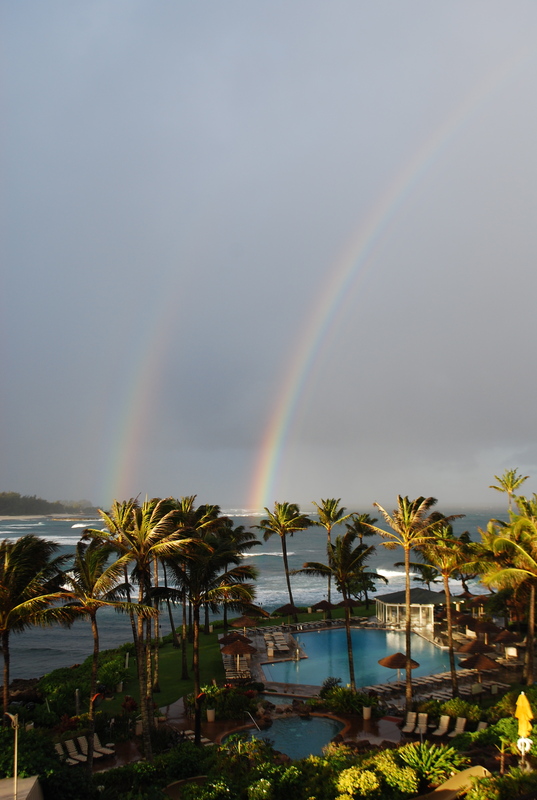 Wednesday morning greeted us with a double rainbow right outside our hotel room window. Talk about a blessing. 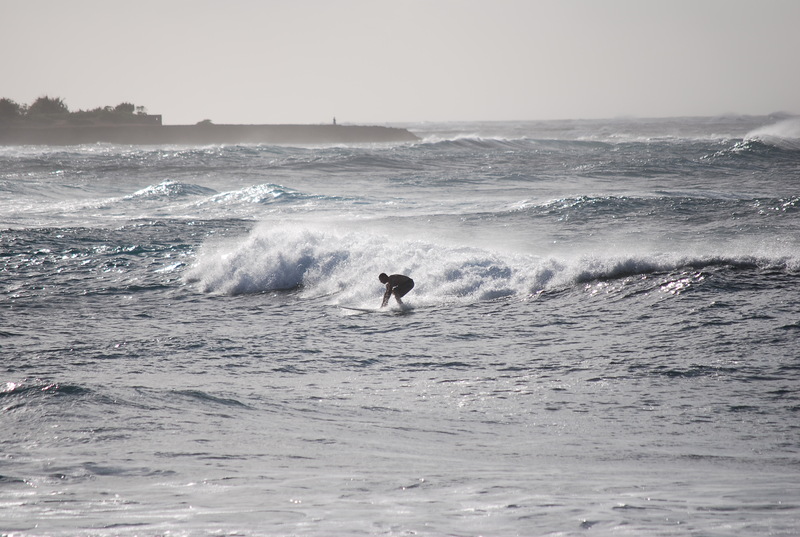 Add to that some time for my husband to surf in the challenging waves that side of the island has to offer, while I embraced a relaxing moment in the jaccuzzi, then topping it all off with a dazzling and romantic sunset moment, I have to say that it made for a wonderful holiday celebration. Tonight we will join some of the local Jewish community at Pearl Harbor’s Aloha Jewish Chapel for Erev Shabbat and Chanukkah services, latkes and song. Others will celebrate at Honolulu’s Temple Emanu-El, but we can’t be at two places at once tonight. Chag Sameach to you and your family and may it’s light and miracles brighten each of our lives on this 4th night of Chanukkah.